Kent face an uphill battle to prevent their sixth defeat of the four-day campaign after Gloucestershire dictated terms on day three in Canterbury. Having secured a 15-run first innings lead, Gloucestershire batted impressively second time around to post 432, courtesy of hundreds from Will Tavare and a swashbuckling 140 from Alex Gidman, in his farewell appearance for the county. In reply, Kent stumbled through to stumps on 95 for 4 to trail by 353 going into the final day of the season. Resuming on their impressive overnight total of 208 for 2, Gloucestershire suffered two early casualties including that of overnight century-maker Tavare. Having seen Gidman post an 87-ball 50, Tavare departed having added only four to his Wednesday night score of 101 and with the team total on 222 for 2. Defeated when attempting to drive a full-length ball, Tavare was skittled by Mitchell Claydon to end a third-wicket stand of 116 in 28.4 overs. Four deliveries later, Claydon was celebrating his seventh scalp of the match when Hamish Marshall clipped a cut shot straight into the hands of Brendan Nash at point. Gidman cracked on after lunch to post a 136-ball century but, with his score on 140, Claydon returned to york him and spark a mini collapse as David Griffiths, on his Kent Championship bow, bagged three wickets in four balls. But Gloucestershire, who have battled strongly throughout the first four days here, dug in through tenth wicket partners Tom Smith and Liam Norwell to frustrate Kent for a further 16 overs. The pair added 76 more crucial runs before Griffiths, a winter recruit from Hampshire, returned to skittle Norwell and end the visiting innings with 23 overs remaining in the day. Without their injured opening bat Rob Key and usual No. 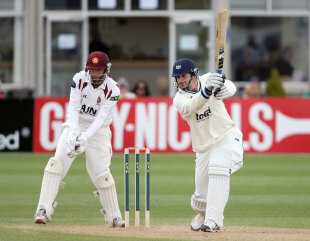 3 Ben Harmison, Kent's reshuffled top order once again struggled to cope with Gloucestershire's buoyant seam attack. Daniel Bell-Drummond missed out on a 1,000-run season when he fell leg before to Craig Miles for only five, who then re-arranged the stumps of Fabian Cowdrey with one that nipped back through the right-hander's gate. Nash played down the wrong line to David Payne and Sam Billings, Kent's first-innings top-scorer, aimed an over adventurous drive against Norwell to lose off stump. With 353 still required, Kent face a mammoth task merely to save the game, let alone land their sixth win of a Jekyll and Hyde campaign. Talking after his match-defining century, Gloucestershire's Tavare said: "I got a text message of congratulation from my uncle [Chris Tavare] after my hundred. Most of my family come from Kent and they've all been at the game at some point, which has been really great. "To think Chris played something like 200 matches here almost scares me. So for me to come here and score a hundred on the ground where my dad played as a kid, my uncles played, and where my granddad used to cycle for over an hour just to come and watch, meant a great deal to me."